The booklet of the conference (including the agenda, information on the side events, and the list of participants) is now available!! The Second Annual Forum of the EU Strategy for the Danube Region (EUSDR), jointly organised between the Government of Romania and the European Commission, will take place at the International Conference Centre/Palace of the Parliament in Bucharest, Romania, on 28-29 October 2013. Last year's Annual Forum took place in Regensburg (Bavaria, Germany) and it was focused on the potential contribution of the Danube Strategy to Europe's growth. More than 600 participants attended, including Germany's Chancellor Merkel and ministers from several countries in the Danube Region. 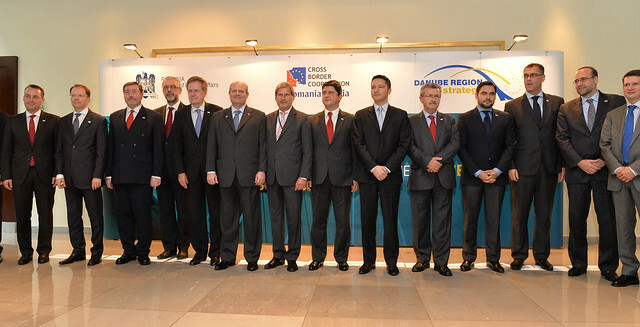 The title of this year's Forum will be "Danube Region - stronger together, stronger in the world". Within this framework, it will encourage a debate on how the Strategy is helping to tackle joint challenges and how this is having an influence in striving competitiveness. The publication of the 1st report on the implementation of the Strategy (April 2013) and the crucial stage of the negotiations for the future programmes in the period 2014-2020 will shape the debates among decision-makers from business, politics, international organisations and civil society coming from all over the Danube Region. Visit the Event's Secretariat website to have further information on the venues, accommodation and travel arrangements. Follow the Strategy in Facebook and Twitter. The agenda is organised around three Plenary sessions, with key EUSDR actors reflecting on the state of play and future outlook: 1) Stronger in the world: The Danube Strategy as driver for growth, jobs and global impact, 2) Stronger together: The Danube Strategy balancing economy and ecology, 3) Financing the Danube Strategy; and four parallel thematic workshops which are planned to provide a space for an interactive exchange of experiences and opinions on issues such as ownership of the EUSDR, its multi-level governance, effective implementation of initiatives and possible funding sources: 1) ’Connected Danube Region’, 2) ’Green Danube Region’, 3) ‘Smart and inclusive Danube Region’ and 4) ‘Effective, attractive and safe Danube Region. Several events will take place in parallel with the Annual Forum, such as the 3rd Danube Financing Dialogue organised by the Priority Area 10 'Institutional capacity and cooperation', on 30-31 October in the premises of the Romanian National Bank in Bucharest and the Workshop on Danube Innovation Partnership organised by the Joint Research Centre, which will take place on 29 October. A number of back-to-back meetings (by invitation only) will also be held, including a meeting of the ministers of Foreign Affairs of the Danube countries , a meeting of the Ministers of Regional Development , a meeting of the National Contact Points and Priority Area Coordinators, and the Steering Group meetings of the Priority Areas 3 'Culture and tourism', 8 'Competitiveness' and 9 'People and skills' of the EU Strategy for the Danube Region.